Feature: Polarity switch is handy when you have to use a variety of keyboards. Plus the hard rubber mat, althogh it will slip on a floor, if you rotate it around and put your foot on it it will not slip. If the pedal itself could be designed to resemble a real piano pedal it would be better. Quality: I have not experienced any problems with it. I take very good care of my equipment as I travel a lot on the road and I make sure it is never banged around. Value: Probably a little overpriced. 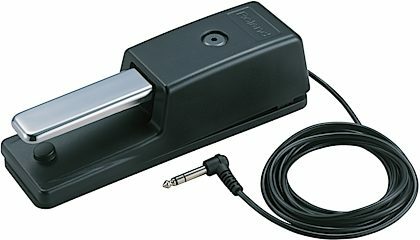 "Great pedal - doesn't move"
Overall: I've been using this model sustain pedal for 15+ years. I love the rubber foot that swings out. This no rarely moves on you. Solid build and well made. I just added another to the family. Next new board I get, I'll likely get another.